Do you have irritable bowel syndrome (IBS) or other digestive problems? Then this app is for you. It is completely free without ads and in-app purchases. 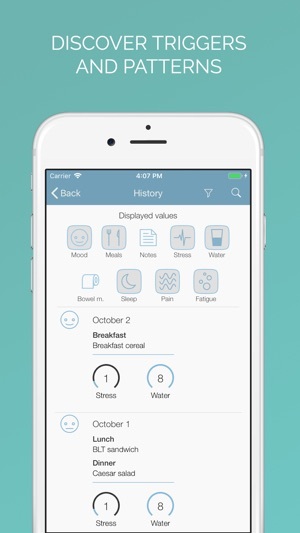 Bowelle is designed to be the quickest, most easy-to-use food & symptom diary on the App Store. Beautiful visual representations make it easier to discover patterns and determine how you feel over longer periods of time. You can track how you feel, what you eat, water intake, stress levels, bowel movements, notes and custom fields you define. By keeping a diary, you may learn significantly more about your patterns and possible triggers. • Visual representations allow you determine trends and overlap different data types. • The daily averages are easily accessible from the side menu. • They are also configurable and can be based on the past 14, 30 or 60 days. Alternatively, you can base it on all existing data. • Use the detailed history to see all data. • Filter it by what you are interested in to narrow down the scope. • Export your data via email and share it with your doctor, nutritionist or dietitian. 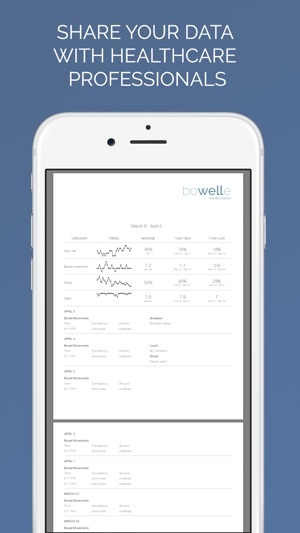 Download Bowelle now and start keeping a journal today! "It is stunning to read studies indicating that as many as 10-20% of the world’s population have IBS. The symptoms can vary so considerably from individual to individual that one may wonder if it is even the same condition. I created Bowelle because there is a need for a fresh and modern approach in the marketplace. If you are reading this, chances are that your symptoms are affecting your life more than you like. By keeping a record every day, my hope is that you will identify some of the triggers causing your symptoms. If you have any suggestions or feedback, feel free to drop me a note at feedback@bowelle.com. I will listen to everything coming my way." What do you think about Bowelle? All App Store reviews are read no matter what language they are written in. If you have feedback or suggestions, feel free to direct it to feedback@bowelle.com. I have tried a lot of digestion apps and this is the only one I am still using after 450+ days. My Gastroenterologist was very impress to see over a year of tracking. It helped him see the current treatment with the low FODMAP diet alone is working better than when we tried to treat it with just medication. So glad this app is available. And for the record I would pay for it if it started charging. One of the features I love is the ability to customer what you want to track and add in custom symptoms. I have mad sugar cravings. So I track that. I have various digestive discomforts all of which I can track. It’s very helpful also to set the alert, mine goes off at 9pm to ask if you forgot to make an update today. I frequently forget during a busy day but I usually make an entry when the alert pops up. There are some improvements I would suggest, like the ability to delete symptoms I added which I no longer track. 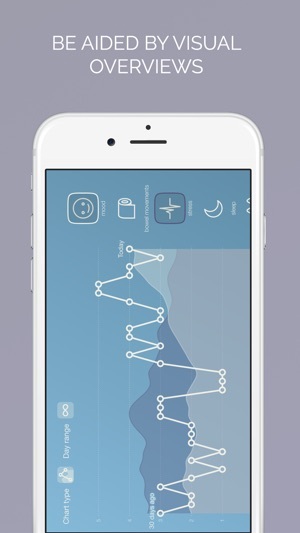 But all in all this is a simple and easy to use app for tracking bowel frequency and context. 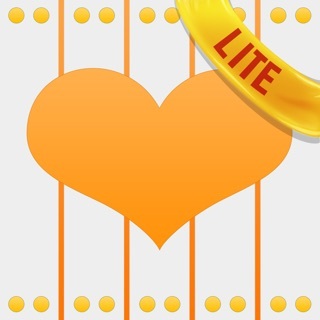 Great app. Highly recommend. Love that it’s free but I would pay for it to keep it if that ever changed. I give my best to the developer and thank him for this tracking tool. It has helped me so much to manage IBS symptoms. 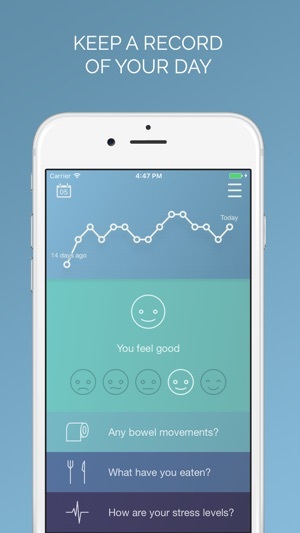 I have been searching and searching for an app to track my symptoms of IBS as well as other symptoms. I swear I have tried at least ten. They either restrict the amount of symptoms you can track before you have to pay, or they are confusing and not user friendly. Bowelle is the most amazing thing I have found. Not only does it help me accurately and precisely track my IBS symptoms, but I can customize it to track other things as well. The layout of the app is beautiful and the ease of use is fantastic. It’s so simple to use, it doesn’t even feel like I’m tracking anything. With other apps I would get so bogged down by how annoying it was to track, that I would forget to do it. The reports and history that you can view have been very helpful in identifying triggers for my symptoms and useful for my doctors diagnosis as well. I recommend Bowelle 10/10 over and over for anyone. Even if you don’t have IBS, it will be the best tracker you can find, I promise. After a stem cell transplant, chemotherapy, and depression it has been hard to remember everything. Its hard to remember to write things down especially if I dont have my planner on me and this app takes care of that. Almost wish there was a separate section for notes, blood pressure, and heart rate. 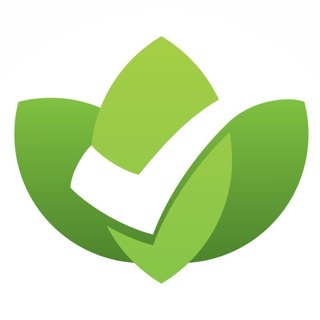 As far as i have seen so far the only note part is in the food category; but after this review I will mess around more and see what more the application has to offer for me and others. With that said, being able to write my own details of my IBS descriptions helps a TON when I go to look back. On that note I wish there was also a small note section in the stress section to describe my feelings to help me when at the doctors. Thanks Bowelle for so far a seemingly flawless and helpful application, I can’t imagine how many lives you have helped other than mine. Thank You. Thanks for your review. Adding a custom notes field to the stress section is possible. 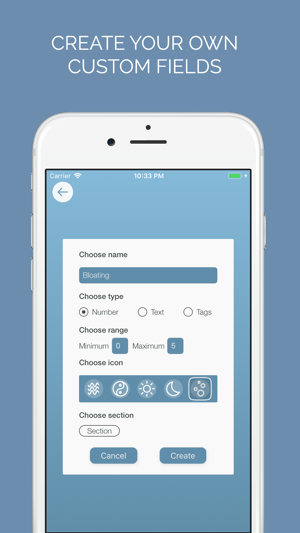 To create one, open up the menu, then tap ‘Settings’ and then ‘Custom tracking’.